Enhance your Latino cultural awareness while having fun this summer. Sign up for our Summer Camps! All day and Half day camps available. 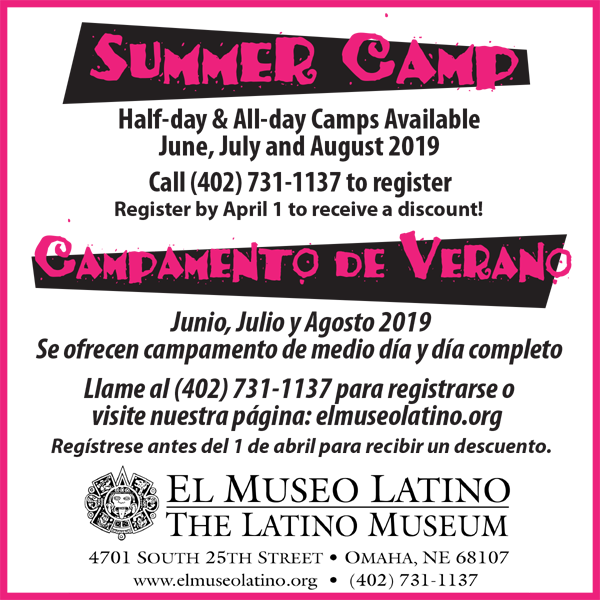 El Museo Latino is a 501(c)(3) nonprofit organization in Omaha, Nebraska. Our mission is to collect, exhibit and interpret Latino arts of the Americas. El Museo Latino is committed to strengthening the artistic and creative culture of the Greater Omaha Area through the presentation of Latino arts, by providing direct support to local artists, by increasing the visibility of Latino art forms, and by fostering an appreciation of art for the benefit of a diverse audience. Explore the creativity and works by Latino artists from Pre-Colombian to Contemporary arts through our permanent and special exhibitions. El Museo Latino offers cultural educational programming year-round. On-going programs as well as exhibit specific programs are offered for children, teens, and adults. El Museo Latino is able to provide the opportunity to attend world-class exhibitions, programs, and community events thanks to your support as a volunteer, by becoming a Museo member, an annual donor, or a sponsor. Donate now to El Museo Latino. Support El Museo Latino by visiting the museum and viewing world-class exhibitions, by attending a class, workshop or an event, or by becoming a member or a sponsor. El Museo Latino offers cultural programs year-round in the visual and performing arts for children, teens, and adults. Call the museum (402) 731-1137 for more information and current class offerings. El Museo Latino is located at 4701 South 25 Street, Omaha, Nebraska at the corner of 25th & "L" Streets. Follow directional signs from the Kennedy Freeway and East/West signs on "L" Street. Parking is available across from the museum, on 25th Street, next to the fire station. Compliments of Wells Fargo.